In some ways, Rough & Tough, John Hammonds new Chesky Records release, harkens back to that first recording Hammond did with Vanguard Records nearly 50 years ago. But over time, Hammond has become a force of nature onto himself, closer in spirit to the icons he emulated as a young man. His guitar playing has become stronger, his expression deepened by the years. Since its release, Rough & Tough has wasted no time and reached #13 on the Billboard Blues charts. "This recording is not unlike a live show that I would do except that there was no live audience to perform for," says Hammond. "It's been a while since I've had a solo album out, so I'm very happy with it." With a career that spans over three decades, John Hammond is one of handful of white blues musicians who was on the scene at the beginning of the first blues renaissance of the mid-'60s. That revival, brought on by renewed interest in folk music around the U.S., brought about career boosts for many of the great classic blues players, including Mississippi John Hurt, Rev. Gary Davis, and Skip James. Some critics have described Hammond as a white Robert Johnson, and Hammond does justice to classic blues by combining powerful guitar and harmonica playing with expressive vocals and a dignified stage presence. 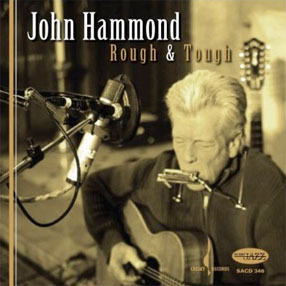 Within the first decade of his career as a performer, Hammond began crafting a niche for himself that is completely his own: the solo guitar man, harmonica slung in a rack around his neck, reinterpreting classic blues songs from the 1930s, '40s, and '50s. Yet, as several of his mid-'90s recordings for the Pointblank label demonstrate, he's also a capable bandleader who plays wonderful electric guitar. This guitar-playing and ensemble work can be heard on Found True Love and Got Love If You Want It, both for the Pointblank/Virgin label. Born November 13, 1942, in New York City, the son of the famous Columbia Records talent scout John Hammond, Sr., what most people don't know is that Hammond didn't grow up with his father. His parents split when he was young, and he would see his father several times a year. He first began playing guitar while attending a private high school, and he was particularly fascinated with slide guitar technique. He saw his idol, Jimmy Reed, perform at New York's Apollo Theater, and he's never been the same since. After attending Antioch College in Ohio on a scholarship for a year, he left to pursue a career as a blues musician. By 1962, with the folk revival starting to heat up, Hammond had attracted a following in the coffeehouse circuit, performing in the tradition of the classic country blues singers he loved so much. By the time he was just 20 years old, he had been interviewed for the New York Times before one of his East Coast festival performances, and he was a certified national act. As with Dr. John and other blues musicians who've recorded more than two dozen albums, there are many great recordings that provide a good introduction to the man's body of work. His self-titled debut for the Vanguard label has now been reissued on compact disc by the company's new owners, The Welk Music Group, and other good recordings to check out (on vinyl and/or compact disc) include I Can Tell (recorded with Bill Wyman from the Rolling Stones), Southern Fried (1968), Source Point (1970, Columbia), and his most recent string of early- and mid-'90s albums for Pointblank/Virgin Records, Got Love If You Want It, Trouble No More (both produced by J.J. Cale), and Found True Love. He didn't know it when he was 20, and he may not realize it now, but Hammond deserves special commendation for keeping many of the classic blues songs alive. When fans see Hammond perform them, as Dr. John has observed many times with his music and the music of others, the fans often want to go back further, and find out who did the original versions of the songs Hammond now plays. Although he's a multi-dimensional artist, one thing Hammond has never professed to be is a songwriter. In the early years of his career, it was more important to him that he bring the art form to a wider audience by performing classic - in some cases forgotten - songs. Now, more than 30 years later, Hammond continues to do this, touring all over the U.S., Canada, and Europe from his base in northern New Jersey. He continued to release albums into the new millennium with three discs on the Back Porch label, including Ready for Love in 2002, produced David Hidalgo of Los Lobos, In Your Arms Again in 2005, and Push Comes to Shove in 2007. Whether it's with a band or by himself, Hammond can do it all. Seeing him perform live, one still gets the sense that some of the best is still to come from this energetic bluesman.